DIY風景 - 壁紙を剥がしているところ。Peeling old wallpaper. Room 409 - My favorite room "terra cotta". Room 406 with relaxing Sana chan on the chair. 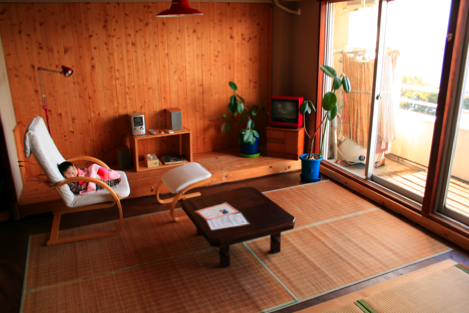 Room 408 - Japanese style room. Room 405 - The designer room for 4~5 persons. 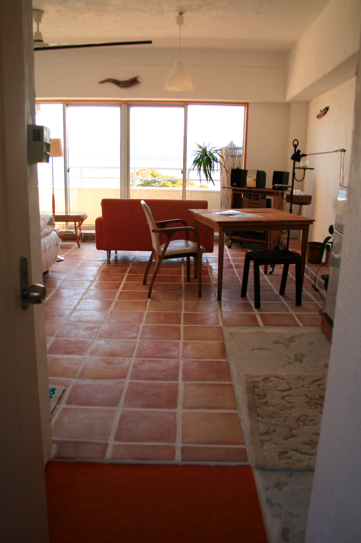 All rooms have small kitchen and bath/toilet. The old facility were called "Sunny Green" and it used to be a vacation condominium where people owned each rooms and used as a summer house. 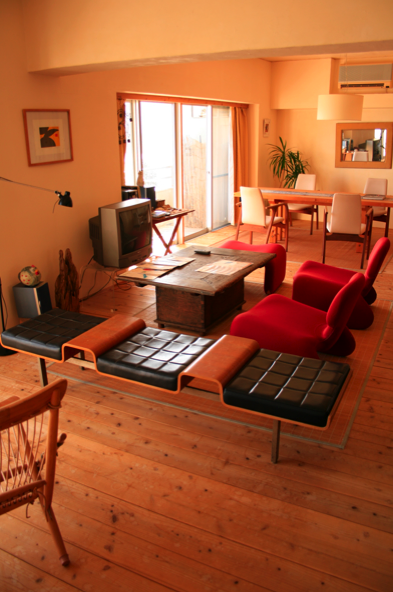 The building got old and Mitsu chan bought each rooms one by one and retained those rooms as KAIYU condominium by renovating each rooms by himself. The new ONSEN (hot spring) facility also has two rooms for stay, which are made from natural woods and local TOSA WASHI paper. I think this new facility is fancy enough to make people be surprised at finding this place. 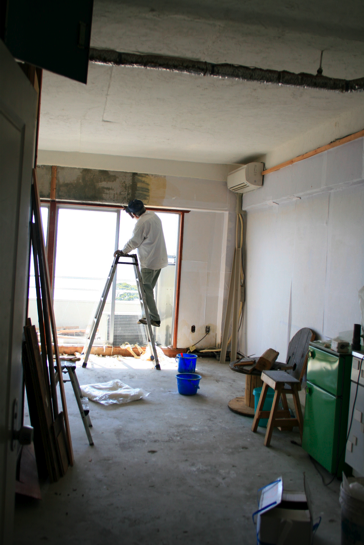 and also, Mitsu chan kindly offered a "tour" of old facility space, he renovated each rooms with different concept, so all rooms were different. I was again fascinated by that unique approach and took to this place. I LOVE so called "luxury" things and places, but also some how be interested in unique, extraordinary stuff as well. I can say, KAIYU is very "unique" in a positive way. 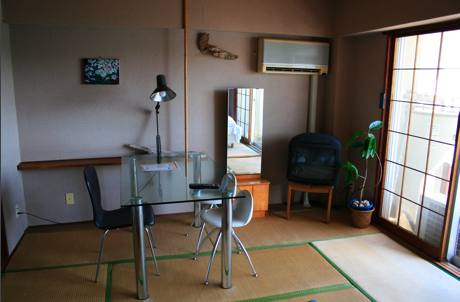 During this stay, to refresh the current KAIYU homepage is one of my assignment, so I took some room pictures to introduce these rooms on the web. All the rooms here have beautiful ocean view and my photo turned out to be "stylish" one with blue and fancy sun light. I was happy with my work, and showed them to Mitsu chan how he thinks. Mitsu chan first said it looked great and he liked it, and soon added important comment. "Well, I think these are TOO fancy for us. With these photo, people may think "Wow, very nice place!" and set higher expectation than what we will offer. To be honest, this place is old and those rooms were handmade by me so it's not perfect." I agree that with photos, I can trim a right portion which looks nice, and ignore the shabby part. Maybe my photo might look 20-30% nicer than the real rooms...but.. He said "So, I also want to use the power of movie and published via Youtube. I think with the video camera, you can see the real size of the room and maybe more detailed parts or whole atmosphere which photo cannot pass to the audience." OK, now I get what he means. He wants to be honest and also show the bad side as well. To me, a web should be something cool, which can "capture" new customers instantly, and make them want to come this place. However it won't match Kaiyu's stance "Don't overwork or put on airs, do our 70%". The baseline is to establish and continue long relationships with the visitors. Mitsu chan does unique filter check when people first contact KAIYU if he think the person will match and understand KAIYU's policy. Sometimes it is so unique that people get confused, but that is how Okada family keeps this place and increase their fans all over the world in last 10 years. If people understand and agree with it, they will come, if not, they won't come.